Nothing interesting enough to post about has happened lately in my history work, I’m afraid. But I did feel like baking something this afternoon, and picked a molasses cookie recipe out of this 1932 Royal Baking Powder company booklet. They came out very well. The amount of baking powder in the original recipe is correct. But it might not have been in earlier editions: every page has a note at the bottom, All measurements are level. Four level teaspoons of baking powder about equal one heaping teaspoon as heretofore used. Look at that! They used the word “heretofore”! Mix together shortening, molasses, and warm water; add beaten egg. Sift together dry ingredients and add to the first mixture; mix thoroughly and let stand about 10 minutes. Roll out on floured board to 1/3 inch thick; cut with round cookie cutter. Bake in moderate oven at 400 F. about 15 minutes. Makes 4 dozen. Actually it makes 26 cookies when you use a 2-3/4 inch cookie cutter like I did. I suspected that 15 minutes would be too long in a modern oven, and I was right – I think 13 minutes would be perfect. With smaller cookies, though, 10 minutes would probably be the right time. 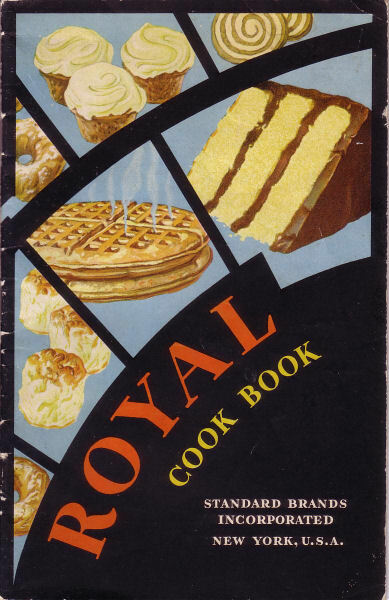 Since 1878 the Royal Cook Book has been the popular handbook of good cooking among housewives. In this latest edition the baking recipes have all been retested – and written in the simplest form. The most popular of the older recipes and dozens of attractive new ones are here, making the book more helpful and satisfactory than ever. Millions of women have found the Royal Cook Book to be what we intended it to be – a practical and trustworthy guide to good cooking. The young housewife or experienced cook will find complete simple directions for making many delicious foods, including a wide field of cookery – soups, meats, eggs, vegetables, salads, puddings and desserts. Wow, if I could get one of those 1878 booklets for my collection, that would be something.